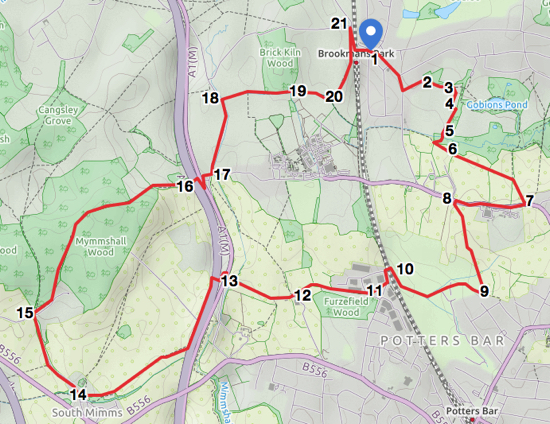 An undulating walk heading south from Brookmans Park touching the outskirts of Potters Bar, heading over towards South Mimms and back to Brookmans Park. Head south along Bluebridge Road from Brookmans Park’s Bradmore Green and take the second road on the left, Bluebridge Avenue. Walk to the end of Bluebridge Avenue and go through the gate into Moffats Open Space where you turn right and head for the gap in the hedge. Go through the gap and turn diagonally to your left heading south east walking over the field. 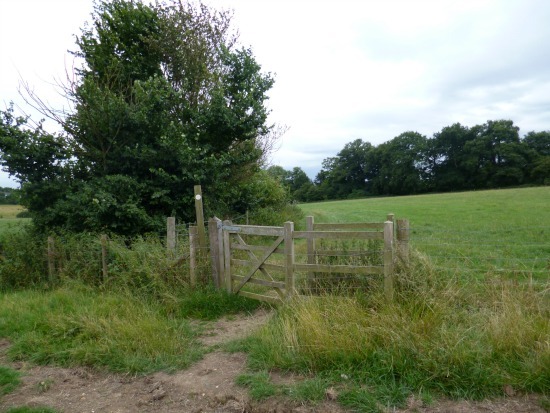 You will come to a gate in the hedge with a path heading due south heading through Leach Fields. Take this path until you reach a footpath T junction. Turn left on the path and follow it as it heads east and then bends round to the right heading south. Continue until you reach a gate in the hedge on your left. Go through and immediately turn right crossing a footbridge. On the other side turn right and follow the path until it branches left and climbs through the woods. Take this branch. At the top you will come to a footpath T junction. Turn left and follow the path through a fairly new plantation on the edge of Gobions Woodland. At the end of the plantation you come to another footbridge but you head right to the gate leading to an open field. * Go through the gate and head diagonally south-east across the field heading for Folly Arch in the distance. Cross the field, go over a small footbridge, cross the next field, go through a gate and then cross the third field emerging on Hawkshead Road to the right of Folly Arch. Keep looking to your left and you will see a footpath sign pointing south. Take this. Head diagonally across the field to a gate, across the next field to another gate and follow the hedge south to a third gate. Continue following this path south until it hits the outskirts of Potters Bar at a footpath T junction. Turn right. Follow this path as it crosses Potters Bar golf course. There are white signs with faded yellow arrows to help you. The path follows a small brook on our left, crosses a number of fairways and then bends to the right at a point where the brook meets another. Continue following this path until it reaches the railway and heads north. Continue until you reach a tunnel on your left. Go through the tunnel under the railway line and turn left at the other side. When you get to the Cranborne Industrial Estate turn left, cross the road and take the footpath on your right at the first bend. Follow the path along the right side of a small brook until you reach the road. Cross the road heading for the footpath sign diagonally to your right. (Don’t go into Furzefield Woods at this stage. Your path is just to the right of that entrance and follows Potters Bar Brook on the right hand side. Continue to follow Potters Bar Brook as you emerge from the woods via a gate. When you come to the farm, cross the bridge over Potters Bar Brook and, on the other side, follow the path to your right heading west with the hedgerow on your right until you reach a footbridge, a ford, and then emerge on Swanland Road. Cross Swanland Road heading diagonally to your right and take the footpath towards the A1 (M). This is a small lane which bends and goes under the A1(M) through a tunnel. On the other side turn left and walk south down the right hand side of the A1(M). Follow the path as it turns to the right and heads west with fields on each side until you reach Brookside Park and emerge on Brookside. Turn right on Brookside until you reach Blackhorse Road where you turn right and continue uphill heading north. (There is the option here of refreshments at The Black Horse if you are in need of a break). At the top of the hill the road bends to the left but you continue straight until you reach a small cottage. Immediately before the cottage is a path on your right. Take this and climb north east up this path with a farm on your right. This path continues through pine woods and drops down the other side towards the A1(M) along Love Lane. Just before you reach the A1(M), at the point where the path turns left, you take the path on the right which crosses the A1(M) via a footbridge. At the other side, turn right and double back under the footbridge to Swanland Road. Cross Swanland Road and head down the lane opposite leading to Warrengate Road. Turn left and follow Warrengate Road north until you pass the water works on your right. Almost immediately after, you will see a footpath sign and a footbridge crossing Mimmshall Brook. Follow this path, cross the bridge and walk along a boardwalk as it bends to the right and through the woods emerging at a gate. Go through the gate and turn right. Cross the footbridge on your right and turn left. Continue along this path with the hedge on your left and the field on your right until you reach a gate. Turn left, cross the footbridge and follow the footpath north until it reaches Station Road. Turn right on Station Road and follow it round to the left, over the railway and back to Brookmans Park’s Bradmore Green where there are plenty of options for refreshments. * At this point you can cross the footbridge and continue heading east along the southern edge of Gobions Woodland and pick up this route via a gate on the right just before you reach the wooden footbridge. ** There is a private footpath built by the RVC from Bolton’s Farm along the south side of Hawkshead Lane which students can use to avoid having to walk along the verge.